Son of one Abdul Gani Paul, Shakir holds a BA degree and a post graduate diploma in computer sciences. Srinagar: Another youth from south Kashmir has joined militancy after he was reported to have gone missing a few days back. 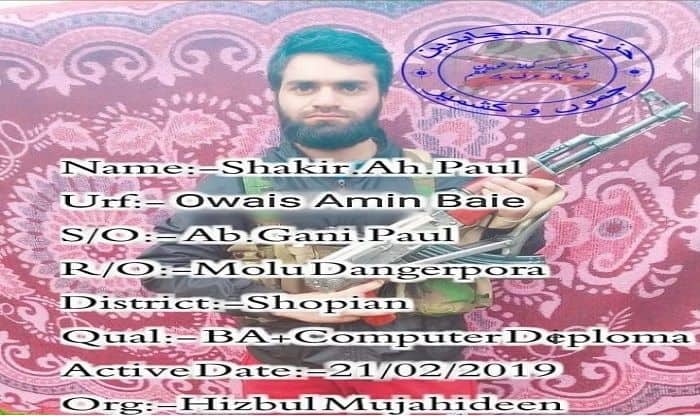 Shakir Ahmed Paul alias Owais, a resident of Moolu in Nagbal area in Shopian has joined terror outfit Hizbul Mujahideen, reports of which were confirmed after his pictures with rifles and a stamp of the group on it emerged. According to his family, he left home a few days ago and never returned. The family says they have been looking for him since. On the other hand, four terrorists were gunned down early Monday morning in an intense exchange of fire with a joint team of forces at Lassipora area of Pulwama district in south Kashmir. Three Army personnel and a Jammu and Kashmir Police official suffered injuries in the encounter but are believed to be in stable condition. The slain terrorists were reportedly members of terror organisation Lashkar-e-Taiba (LeT), though their identities are yet to be ascertained. The forces have recovered two AK rifles, an SLR and a pistol from the site. In addition, Pakistani forces have been violating ceasefire in the Shahpur and Kerni areas of Poonch district along the LoC since 7:45 AM today. They are resorting to shelling with mortars and firing small arms. The Indian Army is also retaliating.